Failed sediment controls on the North Fork of the South Branch of the Potomac River. Photo by WVDEP. Another pipeline has been cited for water quality violations. The WB XPress Pipeline, a 26-mile project in Grant, Randolph, Pendleton and Hardy Counties was recently fined $13,340 by WVDEP for water quality violations to the North Fork of the South Branch of the Potomac River. The proposed agreement for the fine is now open for public comment. Comments are due April 13, send a letter here. 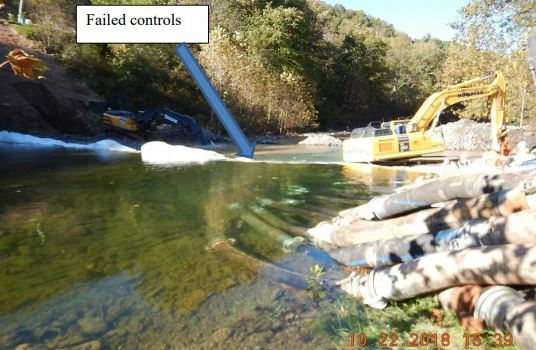 The WB Xpress’ parent company, Columbia Gas Transmission was cited for failing to implement and maintain sediment controls during in-stream construction, which allowed muddy water to impact 19 miles of the North Fork. If that wasn’t bad enough, Columbia didn’t report the muddy water on the spill hotline. The North Fork of the South Branch flows through Seneca Rocks Recreation Area and is hailed as one of the premier trout streams in West Virginia. Columbia’s fine for their water quality violations should account for the severity of their negligence. Contact WVDEP, tell them to hold Columbia accountable for their water quality violations. Request the penalty be increased to account for the severity of impacts and Columbia’s repeated negligence and disrespect of environmental laws. Submit your comments here.